A hair stylist with a hundred pins in her mouth; bridesmaids in various stages of having their hair styled running around the house, the bride lost in one corner and then finally emerging to a round of oohs and aahs looking resplendent in a lovely gown, complimented by an even lovelier hairstyle - a normal scene before any wedding. If it is a fact that the bride looks like a vision on her wedding day, it's due to a combination of different things, one among them being a lovely bridal hairstyle. 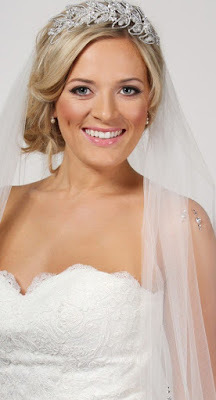 A bridal hairstyle is one of the most talked about and planned aspects of a bride's wardrobe. It can make or break her entire effort to look her best during her nuptials. A lot of planning, going through various catalogues and endless discussions with her maid of honor, friends, and hairstylist help her decide from a plethora of hairstyles available. Needless to say, a bridal hairstyle must look the very best because the bride is the center of attraction during her wedding ceremony and reception. Everyone is going to look at her and maybe even assess her (literally) from head to toe. While there are a multitude of hairstyles to choose from, a bridal hairstyle must match or co-ordinate with the wedding gown, the accessories, the footwear and everything else that completes the look of the bride.Start looking after your hair well before your wedding ceremony. Hair that is well managed and healthy is much easier to style than hair that is unkempt or neglected. Finalize your hairstyle before finalizing your accessories. This will help you see how your hairstyle will look independent of accessories either to accentuate it or ruin the effect. See if your hairstyle matches your accessories. Once your accessories are finalized, it is important that your hairstyle must match them and not cross or hinder them. Schedule the hair appointment well in advance. An elegant hairstyle is not something that can be done at the last minute. A proper amount of time and effort should go into getting it done. Select a style that compliments you. While it is good to experiment and try something new, the basic cut and style of hair should compliment your face. Don't go overboard. It is easy to get carried away in the frenzy and opt for something dramatic and overbearing, but remember, it could also backfire and leave you looking like something went drastically wrong. So keep it simple, but elegant. There are many resources like the internet, bridal magazines, stylists, bridesmaids, and bridal consultants to help you decide the kind of hairstyle and overall look you can have for your wedding ceremony and reception. However, it is important to use these resources effectively. At the end of the day remember a simple tip - you know yourself better than anyone else. You would be the best person to judge what suits you and what does not. Choose wisely and appreciate the effect forever. 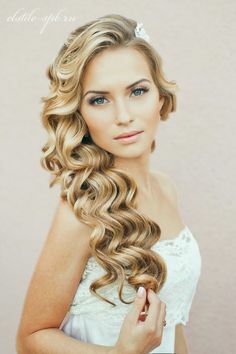 0 Response to "Bridal Hairstyles For Your Wedding Day"